JEC Vac Solutions Ltd, a Rotherham company that supplies dust free vacuuming and conveying solutions, has secured a deal with Lajac, a Swedish manufacturer of dust handling systems, which was looking for a UK-based distributor of its products. Established in 2009, JEC Vac supplies products ranging from small industrial standard vacuum cleaners to the design, manufacturing and supply of vacuum solutions tailored to the customer's requirements. The enterprise is based in RiDO's Fusion @ Magna business centre which means that it can tap into expert support through the ERDF-funded Soft Landing Zone project, which aims to assist Rotherham companies in accessing international markets and also helps foreign inward investors who choose to locate to RiDO's business centres. RiDO's business development co-ordinators identified an opportunity through the Enterprise Europe Network with Swedish firm, Lajac and organised a meeting for managing director of JEC Vac Solutions Ltd, John Clarkson, who travelled to Sweden to meet directors of Lajac. John Clarkson, managing director of JECVac Solutions Ltd, said: "We found there was a great fit between the two businesses. As a business we specialise in supplying bespoke systems, but by becoming a supplier of products and components it means that we will be able to secure a new income stream. We are very excited about this opportunity and hope it will mean we can create new jobs in the local area." Julia Millea, business development co-ordinator for RiDO, added: "An important part of our role is to help Rotherham companies to expand their business by taking advantage of international opportunities. It is really exciting that JEC Vac Solutions has secured the UK distributorship for Lajac products and we look forward to seeing their business growing and developing in the coming months." On leaving school John worked as an mechanical apprentice in the local coal mine and gained mining mechanical engineer qualifications. He progressed into sales and marketing and went on to sell fastening systems to the mining industry, before progressing into vacuum solutions, selling into all industries from food and pharmaceutical through to mining, power and iron and steel, both nationally and internationally. 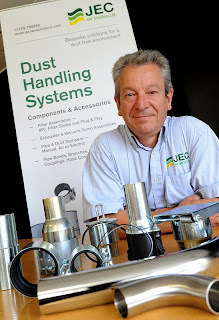 JEC Vac Solutions Ltd was formed by John following redundancy from his previous role as vacuum technologies manager for a major international company.